Can moderate alcohol consumption help reduce joint damage? Swiss researchers followed 2,900 adults who had rheumatoid arthritis. They found that those who were light to moderate drinkers showed a slower advancement of joint damage compared to non-drinkers. Those that drank heavily showed the fastest advancement. Study leaders noted that these findings were in line with past research, which demonstrated that moderate drinking did lower the risk of developing rheumatoid arthritis. This also confirms the general idea that lifestyle factors and nutrition definitely affect the onset and development of arthritis. Gin is flavored with juniper berries, which are rich in vitamin C, catechins, alpha-terpineol, alpha-pinene, betulin caryophyllene, limonene, menthol, rutin, and delta-3-carene. These are all anti-inflammatory compounds. Juniper berries have a long history of medicinal use dating back to the Greeks and Romans, who appeared to use them for medicine prior to food. Research shows that juniper berries contain potent antioxidants as well as antibacterial properties. In Medieval times, juniper berries were used in nosegays, which were small bouquets of flowers one would sniff to cover up the scent of the plague. Perhaps this was a wise application for these medicinally effective berries. Also known as sultana raisins, golden raisins are made from sultana grapes, which hail from Turkey. Loaded with antioxidants such as resveratrol and vitamin C, raisins also contain ferulic acid, gentisic acid and salicylic acid — known pain relievers. In addition, raisins contain potassium and calcium, both of which help protect against bone demineralization. Golden raisins are treated with sulfur dioxide in order to slow down the browning process. After this, they are either oven-dried or flame-dried. Sulfides left on the grapes after drying are thought to provide anti-inflammatory benefits. Sulfur is common in many other treatments for arthritis, including natural sulfur springs, garlic and Epsom salt. This type of simple natural medicine may be more effective than the refined, targeted substances in medications because the properties of the gin and raisins are working together. The exact causative pathways of arthritis are unknown, and there may be many mechanisms in the body that are affected in the development of arthritis. Before you get started, make sure to read the label of your gin to check that it is made from or includes juniper berries. This is critical! Put the raisins in a shallow glass container and pour enough gin into it to just cover the raisins. 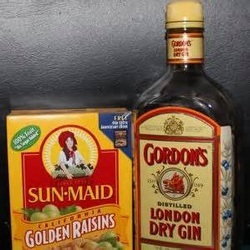 Cover the container and allow to stand until the raisins absorb the gin and the remaining liquid evaporates, about one week. Each day, eat 9-10 of these "drunken" raisins. Avoid if you are taking any medications that preclude or interact with alcohol.